Our first event was located on a downtown street next to the South Charleston Public Library. The event ran smoothly from 10 to 1. The library and the city were very accommodating to our event. We set up with with a couple canopies, a WVEAA banner we've used at other events, and some chairs. We had a cooler of water bottles on ice as refreshments, although no one picked up any during the event. Probably about half the folks that stopped by know about the event ahead of time, from either an article in the regional newspaper, or from social media. All the drivers stayed busy chatting with visitors the entire time. A couple of drivers gave rides to folks. There seemed to be a lot more interest in the BEVs than the hybrids. Especially the shiny new Bolt EV and the Teslas. Folks really enjoyed their rides. A couple folks came specifically to look and ride in different models because they are going to purchase an EV. This was our first event and we will do better next year. Come check out the latest and greatest in EV technology and hear from drivers about how much we love to drive electric, how much more fun, cheaper they are to maintain, and more! Click the blue register button at the top of this page for a chance to win a $250 gift card, too! 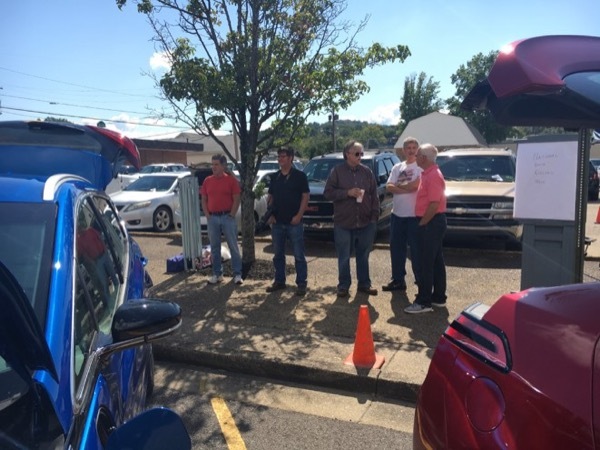 This event will also be a chance to celebrate the four new Level 2 charging stations recently install in downtown South Charleston. Come by and check out the new J-plugs. All are within walking distance of the Drive Electric Week event. Registered attendees report 144,500 electric miles driven.